What follows are my thoughts on reading the entire nine-book ‘Tales of the City’ series, and I promise, there are NO SPOILERS. So, if you’re currently reading any of the nine stories, or plan to start (or finally finish) the series, you can read this without fearing a plot point will be revealed. I’ll start at the beginning. One day during the summer of 1995, my friend Kim emailed me and said ‘You really should read the book ‘Tales of the City’ by Armistead Maupin. You’d love it.’ I filed that away, but that’s all I did. I didn’t immediately go find the book and start reading. Soon after Kim recommended the book to me, Bravo TV broadcast the 1993 miniseries based on that first book. I happened to catch it totally by accident, but five minutes into the first episode, two things were readily apparent: 1) I fell hard for Laura Linney (still love her) and 2) I would be buying the book very soon. After watching the ‘Tales of the City’ miniseries, I discovered there were FIVE subsequent books in the series, and those six books had been packaged in a huge hardcover two volume set. Armed with all six books (albeit in two not so compact volumes); I set out to visit Barbary Lane. It’s hard for me to put into words how I felt after reading the first two ‘Tales’ stories. It was something akin to nostalgia for a place I had never been to and characters that were fictional. That the setting was San Francisco in 1977 made no difference. I completely identified with the characters and relished reading about their adventures, their triumphs and their fears. That first book is the reason why, to this day, I have a soft spot in my heart for any woman named Mona. Those first six books (Tales of the City; More Tales of the City; Further Tales of the City; Babycakes; Significant Others and Sure of You) carried the story from 1977 to 1988 and I often wondered how Mary Ann, Michael Mouse, Mona, Brian and Anna handled the nineties. Since the author Armistead Maupin had moved on to write other books, I considered the series closed and chose to believe that everyone survived the 1989 earthquake, and that Anna Madrigal was often seen sweeping her sidewalk. Imagine my surprise and almost sheer giddiness when, in a bookstore in 2007 I saw a large display that said ‘MICHAEL TOLLIVER LIVES: In stores June 2007!” I couldn’t wait to find out what my ‘friends’ had been up to since The Eighties ended. I remember buying that book on a Friday and being finished by Sunday, and again, I thought the ending was suitable and was happy to catch up with everyone. Fast forward to July of this year: At my current job (a call center), whenever I have down time, I like to read. I have become a big fan of reading eBooks on my iPhone, downloaded from the library. I was trying to think of something fun to read when I decided to search for eBooks available by Maupin. I was thrilled to see almost the entire ‘Tales” series was available (all but Book Six, ‘Sure of You’), but also there had been two new books released since the last one I read in 2007! This had me feeling like a long lost friend had decided to drop by unannounced to say ‘Hi’ after being incommunicado for seven years. I was elated that the series was now nine books long! Sitting at my desk, I saw the new titles that concluded the series (‘Mary Ann in Autumn,’ released in 2010 and ‘The Days of Anna Madrigal,’ released in October 2014) and I had to decide, ‘Do I jump in at Book Eight, or start back at the beginning? Even though I had read the first two books at least four times each, and other books in the series had been read multiple times, I decided to start back at the beginning, because I figured the latter books would reference seemingly minor moments from the earlier books, and I wanted to be able to remember all of it. 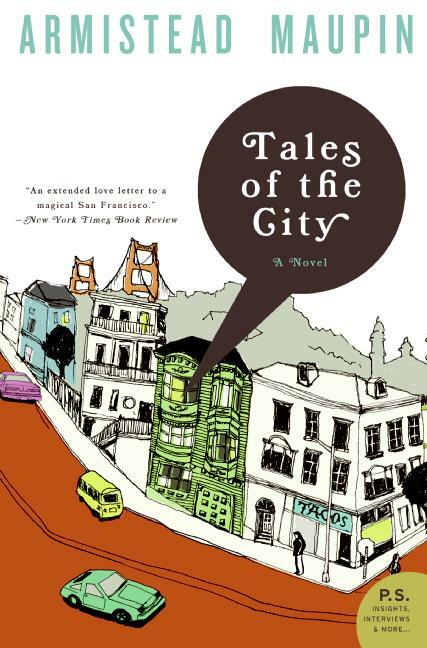 On Wednesday July 8, I started reading ‘Tales of the City’ again (for the fifth time in the last twenty years) and read the other stories that followed. I was surprised at how much I remembered and how wonderful and breezy reading those books is. Of course, since I discovered this wonderful series in the nineties, the first six books were like time capsules of the late 70s/80s and for me had a built in nostalgia. Reading the last three books, set in the present time (more or less), it made the story not only come full circle for me, but it made these characters, though aged, seem more relevant and alive than ever. Wednesday (August 5) I finished reading the ninth (and final?) book in the series. I tore through the first seven books because I love them and I had read them all at least once before. I even read the eighth book quickly because I knew I had another book to read after I was done. With the last one, however, I found myself stalling. It’s not that I didn’t want to know how it ended; it’s just that I wasn’t ready for the series to end yet. It’s been a day since I turned that last page, and I’m still not ready for it to be over. If this ninth book is indeed where the story ends, then I can say Maupin delivers a satisfying ending to a beautiful vibrant series. As a fan, I hope Maupin finds more stories to tell. If that doesn’t happen, then I’m content to start again at Page One of Book One and have it be 1977 once again. ← Podcast Recommendation: "Check Out These Records I Got"